Get Started with Intel Edison and make a Smart Wearable Project. This is an introductory level course on Intel Edison. This course is designed for absolute beginners makers. We have come up with an Introductory course on Intel Edison in which will show you how to get started from the basic level of this cool single board computer. The course requires basic knowledge of Arduino programming language. We’ll help you to get started with the basics of setting up and installation process and also creating circuits with the Intel Edison board. In this course will show you how to use Intel Edison for the first time and how to use Flex sensor with LED, Servo motor, Buzzer and also to control power of light using the serial-3-channel-ac-230v light dimmer module using multiple Flex sensors. Intel Edison and its development board are also very interesting. We makers love microcontrollers a lot! The endless possibilities that these pieces of hardware give to us. Ever wondered how small they keep getting. A board is so small that it removes huge barriers in the world of wearables and the Internet of Things! It’s the Intel Edison Board. This Introduction to Intel Edison for beginner’s course will show you how to get started on working with this cool single board computer. On one way, you can use this board as Arduino with its shields; these are suitable easily. On the other hand, you can connect your board via Wi-Fi to get on the internet. The Intel Edison board is a cool single computer board platform that helps you build amazing stuff just like the Arduino board. Here, you can use platforms like Arduino, Eclipse for working on it. This board uses an Intel Atom processor with a dual-core CPU at 500 MHz and a microcontroller at 100 MHz. The Edison board sports 1GB of memory, 4GB of storage and even has Wi-Fi and Bluetooth 4.0 capabilities. It also has 40 GPIOs for plugging in all sorts of crazy sensors and motors you can think. The module of Intel named Intel Edison is slightly larger than an SD card. After playing around with Edison. The specialty of Edison is that it can use for wearables, and it is powerful enough to control robots. This module equipped with Yocto, a Linux OS. It has an onboard Wi-Fi and Bluetooth, perfect for IoT projects. We can connect to Edison remotely and run commands or access the file system. It gives lots of flexibility to developers via SSH. The prerequisite for this course is a basic understanding of electrical and electronic concepts and ability to download and install software on your computer. Along the way, you will learn about programming, sensors, and communications. The goal of this project is to create a wearable glove integrated with flex sensors so that as the wearer bends his/her fingers it translates to a quantitative value on the circuit board. The goal is that when you bend your fingers, we can control the 230V of light dimmer. If you are a technology enthusiast and want to learn the cutting-edge technology, then this is the right course for you. 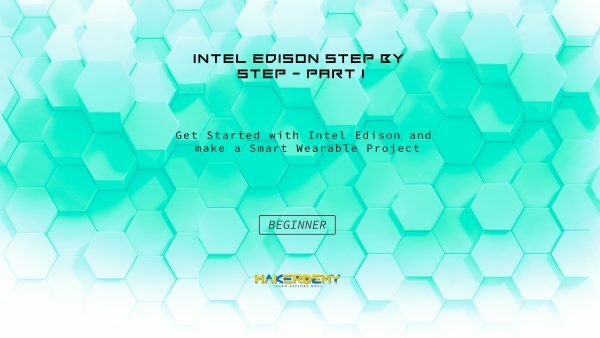 In this course, I will show you how to get up and running on the Intel Edison platform so you can do your projects to interact with the world. I will teach you step by step how to go about building this project. I will also share the code with you so that you can replicate the project yourself. I look forward to you joining this course. It provides the complete source code of the real time project. What are you waiting for? Enroll now.